In a soup pot over medium heat, bring chicken broth, water, 1 clove crushed garlic, 2 tbsp chopped parsley, 1/4 of the chopped onion, tomato sauce, crushed red pepper flakes and fresh black pepper to a boil; simmer about 5 minutes. Meanwhile, make the meatballs by combining ground turkey, parmesan cheese, egg, remaining garlic, remaining onion, remaining parsley, breadcrumbs, salt and pepper. Form into little 1 inch meatballs (about 36). Drop meatballs into the broth, cook about 3 minutes; add pasta and cook according to package directions. Add fresh basil, adjust salt and pepper to taste and serve with grated parmesan cheese. My family loves this soup! It’s a go to recipe now! I love this soup! Its hearty and wholesome and versatile. My whole family loves it and I make it when I have company. I’m following points plus and am so happy you still leave all the different points on your recipes! 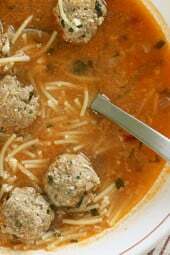 Love this soup the only change I made was instead I used my homemade spaghetti sauce. I used about 50/50 between broth and sauce and didn’t add water. I also added mushrooms and served with garlic croutons. My family (including 2 toddlers) LOVED this soup!! Going into meal rotation for sure :). Thanks, Gina! This is delicious, warm, filling, and fun. I added two more TBS of tomato sauce and doubled the garlic. I made this soup today and it is fabulous. I used frozen turkey meatballs and substituted spaghetti squash for the pasta. Delish!!! ***** stars. Thank you. The meatballs cook enough in three minutes and the boiling of noodles? You don’t need to cook them first? I was wondering the same thing! 3minutes of cooking and they’d still be raw. I’m going to cook mine first. I just read the directions again. They cook in there 3 minutes, then you put in the spaghetti and cook according to package directions so the meatballs end up cooking at least 10 minutes. I’ll probably still cook mine first, but at least 10 minutes is better than 3. If you make the small one inch meatballs it’s plenty of time. Remember you still are cooking after. I love your recipes. We are fans of your picadillo. A while back you posted your go to recipe for ground beef. We made it and it was delicious . 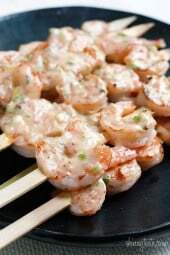 Can you share recipe with me. I can’t find my copy. Gina strikes again!!!! I made this a few days ago and it was awesome!! Fantastic dish! This is definitely a keeper. I added garlic and onion powder to the meatballs. My entire family was impressed. Thank you! This was fantastic and super hearty. Thanks for a great recipe! would pesto work subs. for fresh basil? Made this again tonight. My family LOVES this recipe. wow this was amazing !! I just made it and I am in love, I added fresh spinach to mine … I think I made my meatballs too big though next time I will make them even smaller ! but a huge winner and I will make this again and again ! Made this for dinner tonight. It was delicious!!! WOW! I just made this for my lunches this week and it is Amazing! I can't wait to have it for lunch tomorrow – I love that you have the Smartpoints – thank you! 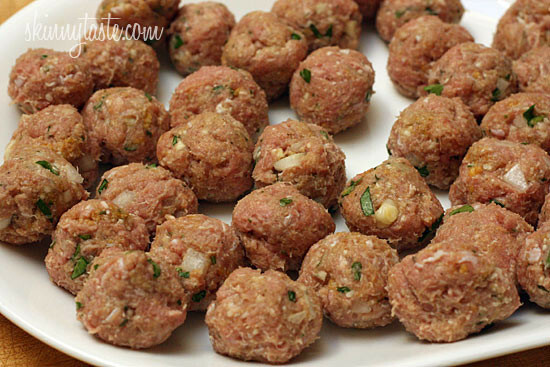 Making this tonight but plan on baking the meatballs first to give them some texture and color. Can't wait to try it! This is so GOOD! My 4 year old loved this! Soup and spaghetti and meatballs his two favorite things in one. Thank you!! YUM this is amazing! Cant wait to see the smart points value you come up with. I put it in recipe builder & got 6SP but I'm not sure its correct! I WILL be making this again! YUMMMM!!!!! Omg! Just when I think the Shiitake chicken soup is my favorite I make this. It is really delicious! Almost everything I try on here is absolutely wonderful. I made this today so that it would be ready for my teenage son to eat between soccer practice and his part-time job. He loved it. When I went to the grocery store, though, they were out of ground turkey. Instead I bought the premade turkey meatballs that you find next to the ground turkey. Made this one super easy! Gina, i'd like to see this with sprialized zucchini or something like butternut squash. i know i'm going to give it a try. I also added northern white beans and spiralized zucchini-delicious! Do I need to adjust anything if I use 96% ground beef instead? So I made a vegetarian (vegan, even, i think) version of this soup and we loved it. I used Gardien meatballs and Better Than Bouillion's "No Chicken Chicken Base" We added more noodles and an extra cup of the broth. It was AWESOME!!! Everyone had seconds. Great recipe. this sounds delish but the look of the meatballs is unappetizing to me. 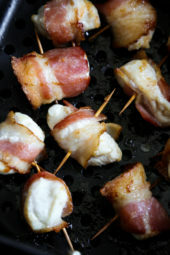 Could I fry them off a bit first to brown them up and then add or fry them completely first and then just add at serving? thanks. I cooked the meatballs first baking them – my family likes that consistency better! This is one of my go to meals! I'll be making it tomorrow during the blizzard here in MA! This soup was amazing! 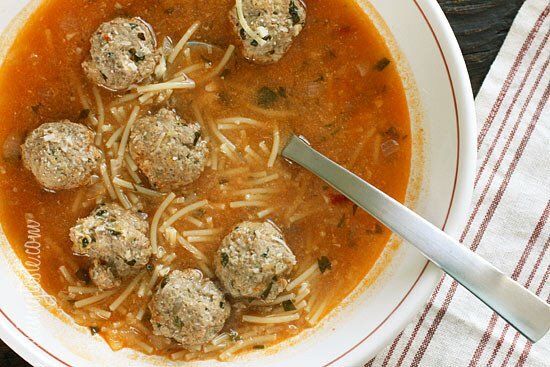 Both the broth and meatballs are so flavorful. It was husband approved and will be going on our dinner rotation. We ate with lite garlic bread for a low point dinner. I agree that next time I will make some more broth since I was mostly left with noodles. Looking forward to my leftovers for lunch tomorrow! I have the same question – this is listed as freezer meals. What is the best way to freeze? Thanks! This was absolutely wonderful!! I am so glad you posted an older recipe that I missed. Please continue to feature some of the oldies but goodies! Oh this sounds yummy! 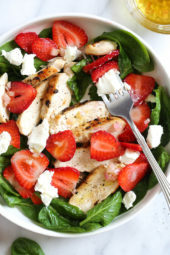 Adding it to my list of meals to make for next week!